AUTHOR’S NOTE: When I wrote this piece, I was at Claremont School of Theology teaching the “World Religions in Dialogue” course. This article comes out of that experience. Elizabeth Conde-Frazier is a Latina religious educator who has taught at the Claremont School of Theology for nearly ten years. Currently, she is dean of Esperanza College of Eastern University in Philadelphia. She has written on participatory action research, second generation youth, multiculturalism, Hispanic Bible institutes, and the spirituality of the scholar. 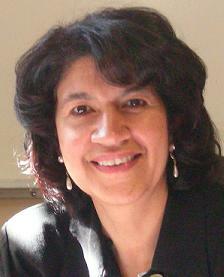 She integrates religious education, practical, and Hispanic/Latina theology. At the Claremont School of Theology, we deal with a multiverse context where students come from many different cultural groups (Vietnamese, Korean, Chinese-American, Nigerian, Mexican, Mexican-American, Puerto Rican, African-American, German, Samoan, Tongan, among others) and theological ranges within Christianity. More recently, there has been a growing diversity of faiths represented (Wiccan, Pagan, Unitarians, Jews, Muslims, Buddhist, and Harikrishna). Among the Christians, we have a variety of mainline denominations (AME, Pentecostals, Charismatics, Armenian Orthodox, Coptic, the Metropolitan Community Church, and Catholics). Given this context, when I enter the classroom there are few assumptions I can make about a common knowledge about students’ traditions. Even the Christian tradition is not the Christian tradition. This means that in the organizing of my courses I include a variety of spaces for us to talk to one another about who we are. For this to happen, persons need to look deeply into whatever tradition has been a part of their lives whether or not they feel that they own that tradition at that particular point. They soon realize that even when they feel that no particular tradition has shaped them, indeed there was a tradition that was lurking in their family’s set of values and patterns of living that shaped them. By listening to these places in their personal history, they are able to have a starting point for defining a new direction or for deepening and expanding their tradition. I will speak about how this is a part of the “World Religions in Dialogue” course that we teach at the Claremont School of Theology. The course takes place during a full academic year. It is broken up into modules rather than semesters. Module #1. The understanding of religion and its role in different faith communities. Module #2. The history of the Christian church’s encounters with other religions and the theologies that informed those encounters. Module #3. Explores our own theologies of world religions. Module #4. Looks at models of religions in dialogue. Students maintain a yearlong “intellectual and becoming” journal where they engage the readings and interactions of experiences at an intellectual and personal level. A final reflection as they read their journal is submitted at the end of the course, where students speak of their beliefs, attitudes, and the way these have been tested, affirmed, or changed. They discuss experiences or moments that were transforming for them. In this discussion, they try to analyze the components of the transformation and how this might be helpful for guiding others on a similar trajectory. We begin with an understanding about religion. This helps students become familiar with different definitions of religion, the different frameworks of religion, and the lenses of these frameworks. From this point, we seek to acquaint students with some of the major religions through text, exposure to worship settings, and interaction with persons who practice the different religions studied. These interactions include lectures, shared meals, sharing a particular social justice practice of that religious community, or participation in other practices with the faithful. Students are left to decide which they feel comfortable with. Students must participate in at least three interactions with a different religious community. When the students have done some initial reading about another religion, but before we discuss it in class, we do a class visit to houses of worship. This is so that students have to experience being strangers. Having too much initial information makes them feel as though they already know what things mean and this shuts them down to new understandings. It locates them in a place of power. In our discussions, we also point out where they begin to compare rather than to explore information more deeply. To understand the place of religion in people’s lives, we study the role of these religious communities for immigrants. For example, we discuss how religion is about reforming community, identity maintenance and formation, and empowerment. This course is constructed to help persons understand their religious and interreligious becoming. Even when we think that we know our tradition well, it is not until we need to look at it from the perspective of an outsider that we realize that there is much about our own tradition that we had not thought about. The assumptions of our beliefs and practices have become like cultural blinders. Reflection upon the process of religious and interreligious becoming places students with a broad understanding of their tradition and students who are somewhat undefined at a semiequal standing. We also arrange for an interreligious panel to take place in class. This is a hard course for students and professors. There are resistances that students bring to this course — rules of discussion are necessary. We have developed a set of rules that has been very helpful. One of the things we do is to encourage people to say “tell me more” when they feel themselves ready to judge. Professors need to be cognizant of the silent and articulate voices. There are moments for contemplation and silent reflection during which some students like to write. It is a way for students from more contemplative cultures to later find their way to express themselves in the discussion. Elders from the Pacific Island cultures may find their moment of wisdom during that time. We may use traditions from another culture that may contribute skills helpful to our process (i.e., the establishing of the “va” in the Samoan culture. The “va” is the space created for relational interaction. Each “va” is different in accordance with the type of relationship being formed). The course makes use of different types of knowledge rather than simply focusing on rational knowledge. Rational knowledge is the intellectual ability to gather, organize, and use information in order to analyze situations. Then there is creative knowing or the capacity to remember, to imagine, and to create. It is the premonition of ideas. This is the person who asks, “What can I do with this information?” Heart knowledge is the capacity to feel. The emotions affect the quality of our interactions and work, as well as influence learning and dialogue. Being able to discern emotions helps us to recognize contradictions and confusion and to gain clarity about power relations. Do not underestimate the conflicts and contradictions that can take place when one encounters others or attempts to create community. Dreams are another source of knowledge. The Western world and its understanding of the enlightenment has trouble with this one, but those of us who did not go through the passageway of the enlightenment have found it to be a rich source of knowing. It is the knowledge that opens up to us the subconscious dimension where all is possible and real and the seemingly bizarre is the key to interpretation. It is the place where the Divine takes the form of symbols. Dreams give us knowledge that constructs a vision. Spirit knowledge is the fifth type. This is the capacity to be and have energy for purpose in life. It connects us with all living entities and is therefore important for coming to a deeper understanding of our interdependence with others whom we may at first perceive as different from ourselves. And lastly, there is holistic knowing; which helps us to see the connections between the different types of knowing and integrates them all. It facilitates synthesis. We originally had another module. It was where we exposed students to a religion other than their own. It was the second module. While it was a good idea, we realized that it was a bit ambitious to cram into seven weeks and so it is now a follow-up course. It also left us with seven additional weeks to expand the first module. As we look at the way that most books define the major religions of the world, we realize that these books are written through Western lenses and when we look at definitions with a postcolonial lens, then these criteria change. We need to have this discussion and to change our selections of which religions are engaged in the first module. Students who come with an undefined religious understanding or who know little of their own tradition must scramble to find the roots of their thinking, their values, and their beliefs. They confront the reasons why they had not given themselves to the formation of a particular tradition. As they write their theologies of world religions, they begin to give shape to a theology that they want to operate out of and to see how that theology will shape not only a set of practices but a whole consciousness. This is important for leaders of religious communities today. A course whose goal it is to bring students on an interreligious becoming is a course that seeks to transform the intersecting ideologies of exclusivism that have given shape to the hegemonies and prejudices we have been socialized into and to function in accordance with them. To transform an ideology and hence its power, one needs to generate a new consciousness with the purpose of developing critical movements or mobilization that require group action and practices for engaging one’s energy in ways that reinforce a different ideology and that have the goal of creating change or an unjust system. Generating a new consciousness involves coming to an awareness of one’s cultural blinders and ideological filters through which we interpret the world. It also involves creating experiences of enough depth, duration, and intensity such that the prevailing interpretations can be transformed. We understand that a curriculum is not sufficient for all this but we can plow the ground for planting the seed or nurture the seed for such transformation to take place. In this course students become aware of these influences in themselves. They learn to identify the lenses that shape the assumptions of a religion and its practices. We speak of the constructs necessary for formation as well as its dangers. Religious leaders today must not only be formed or literate in a tradition but must also understand the constructs and power of the formative pieces of a tradition that they might use them in ways that are life giving. New rituals and symbols that are more relevant to the lived realities of persons may evolve from this type of formation because students have come to understand the constructions of these. The deepening and expanding of the tradition takes place. The energies that kept students away from their traditions are rechanneled in positive ways. The problem will arise when they have to go to ordination councils that wish to see the church become what it always has been, especially as its membership dwindles and they hang on to the last vestiges of their religious practices, while these students have the energy to bring reformation and in a sense revival to these forms and thus the potential for a new expression of the tradition in a changing world. Finding ways to expand and deepen the traditions of a congregation is what we deal with in later required religious education courses in the teaching of the Bible and pedagogies for transformation.